This week, I was disturbed to see that the existing plastic knockdown bollards at the northeast corner of Locke and Herkimer had been removed. 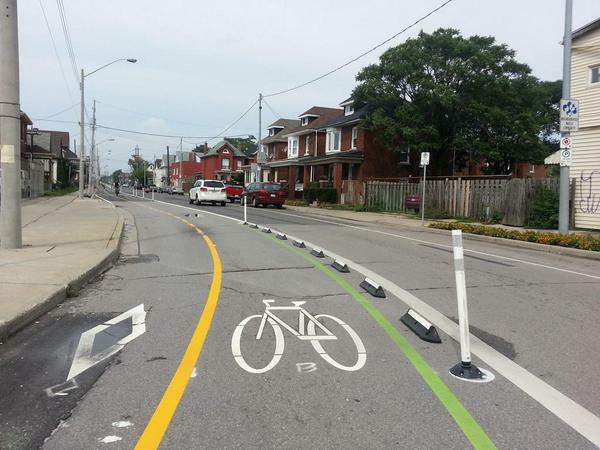 I asked about it at the monthly meeting of the Hamilton Cycling Committee, which was held this past Wednesday. City staff replied that the reason the plastic sticks were removed was to install a permanent concrete bumpout. Good News! This originally started as a guerilla "tactical urbanism" intervention, was updated to paint and plastic sticks, and is now about to be set in concrete. This is a nice example of incremental and constant improvements to the street design. In this case, initiated by residents who saw a need for a better design and backed up by supportive staff. One really good aspect of the design is the way the bumpout works seamlessly with the bike lanes (unlike previous bumpout designs that forced cyclists to move out into the main traffic lanes). Really good to see this sort of collaborative and flexible approach to improving our street design for all users! There are monthly meetings of a Hamilton Cycling Committee? It is a City of Hamilton committee...not a community based committee. For information completeness' sake, there's also http://www.cyclehamont.ca -- the non-government resident/community based one that just started up a year ago. These are separate, but they do inform each other from time to time. Did anyone get permission from Ward 8 before constructing this bump out in Ward 1?? SSSssshhhh.... Don't let Terry Whitehead find out! Well apparently he is now open to the idea of a fully two-way Queen St. I think in the next council meeting he's going to grip his face right between the eyes, dig his fingers in and peel back the skin to reveal his true identity - Mordo - the Master of the Seven Planes! I love how he suggests a contra-flow traffic lane as if he's an engineer. Queen is lined with local residences, and can't continue to be treated as a traffic sewer. Based on traffic data, I imagine it would make sense to shift the parking to the W side of Queen and have 1 travel lane each way. Restrict parking between 3-6pm in order to create 2 SB lanes on Queen in rush hour. Also, I'd like to see this cross-section extend all the way up Queen to Barton Street. Don't stop it at King. This would create a direct route for SW residents and Mountain residents to travel to the West Harbour as well as York Boulevard - the 403 or Farmers Market/James N area without having to cut over to Bay or James Street through Durand. 2-way Queen makes a LOT of sense for many reasons. Yes, the responsibility of council should stop at 'x is a problem, how can we fix it'? Then it goes to the experts - 'how do we fix x'? Or at the most, give us a couple of options to vote on. The bump out seems to be finished. I love the concept, but I wonder if we can start to take these bumpouts a step further and start incorporating some natural elements in them (ideally street trees, or at least planters) so that they can add to the pedestrian "feel" of the places they are installed.... Would this be a question best brought to our Ward 1 councillor? I've long wondered why Hamilton is far behind other cities with urban green treatments. The entire Concession corridor was rebuilt with blank concrete along the sidewalks instead of trees. Herkimer/Locke should be like this. Trees, with NO curb preventing rainwater from running into the garden bed like we still do here for some reason. All over the city we've built street garden planters with curbs keeping the water out, and directing the water into the storm drain system. Then we need to install sprinklers into the flower gardens and spend money watering flowers instead of allowing the rain water to do it.